Happy leap year everyone! How are you enjoying this extra day? I’m sure you are familiar with Orangette, the wildly popular food blog written by the immensely talented Molly Wizenberg. If not, well, you should be. And you should also probably read her book, A Homemade Life: Stories and Recipes from My Kitchen Table (Simon & Schuster Paperbacks, 2009). It was the selection for this month’s Kitchen Reader Book Club (you should join! ), chosen by Jules of Stone Soup and I am so glad I finally got around to reading it. I knew I would like this book from page one. Wizenberg tells of her family’s daily dinners together, sitting around the table every night to share a meal. “We’d be sitting at the kitchen table, the three of us, eating dinner, when my father would lift his head from a plate and say it: ‘You know, we eat better at home than more people do in restaurants.’ Sometimes, for good measure, he’s slap the table and let loose a long ooooh oh contentment.” This description struck a chord with me because it could easily have described my family. We ate, the four of us, dinner every single night together. And my father frequently commented – rightfully so – that it was better than any restaurant. Much like Wizenberg’s family, this wasn’t because the food was particularly fancy (although we definitely ate well). It was the sense of family, of gathering over food, and of creating a homemade life. Part memoir and part cookbook, Wizenberg’s book is the kind you’d like to curl up with. It’s inviting and cozy. Her prose is casual but well-crafted, and makes you feel at home. She describes simple and everyday memories with skill, highlighting the beauty of the special, often overlooked moments we share around food. It’s happy and sad, full of all the joy and heartbreak that families the world over share. It’s highly relatable. I didn’t change a thing when I made the recipe so I’ll have you pop on over to The Wednesday Chef (another great blog) to get it (get the recipe HERE). Tell me – Have you read any great books lately? I’m always on the lookout for recommendations! Aw thanks Jenny! 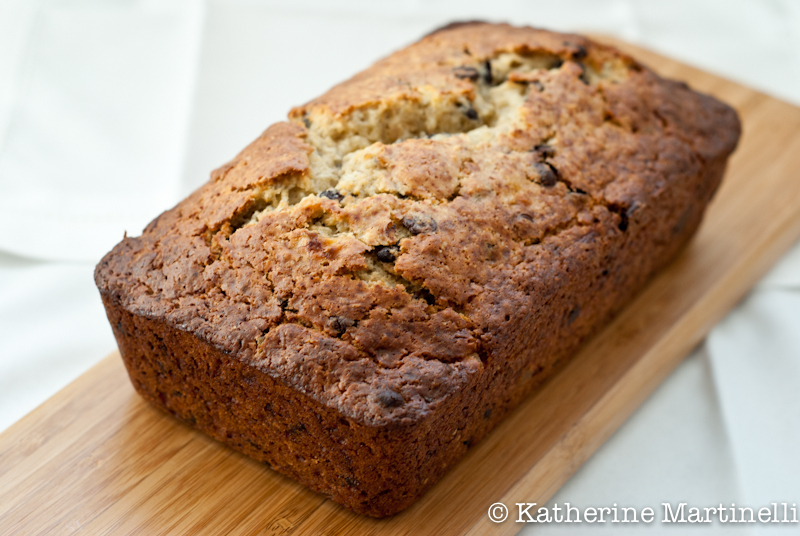 Banana bread is so much easier to make than regular bread. It’s a quick bread, which means there’s no yeast or rising – you just mix the ingredients together and bake! As usual, your timing is perfect. I have three bananas on the counter and a six-hour drive tomorrow that will start at 6:00 am. I know what I’ll be baking tonight! This bread is beautiful! Must be delicious too! Nothing like a fresh baked banana bread! I also agree with you about the dinner seatings, we all sit every night and eat dinner together and I’ll try to keep that going as long as I can..
That’s great that you all have dinner together. It’s really a wonderful thing if you can manage it. Thanks Gerry! The book looks interesting Katherine, I will see to it.. I haven’t baked banana bread in years. Maybe I should again. Nice review of A Homemade Life. A book I highly recommend is A Supper of the Lamb by Robert Farrar Capon. Originally published in the 1960’s, Amazon has a more recent version available (if you have a Kindle, I’d get that version – there are no pictures in the book). What’s cool about this book is the author takes something like the first third of it to get through the first recipe! Sounds kinda weird, right? No, he keeps getting diverted – and the diversions are entertaining and educational. A fun read – I think you’d enjoy it. Oh, Supper of the Lamb is a fantastic book. I also recommend it. Katherine, the recipes in A Homemade Life all looked achievable and tasty. I’m glad you tried the banana bread. I think you were spot on when you said the writing was casual but well-crafted. I aspire to that. Thanks Sarah, I’ll definitely check the book out! I also aspire to that kind of voice in my writing. I can’t get enough banana bread! It’s so easy and delicious. Thanks so much for the book recommendation – it really does sound right up my alley. I’m off to check it out and add it to my wish list right now! 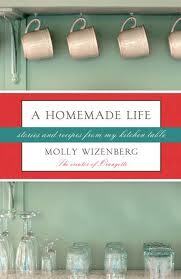 Very familiar with Molly, great writer and great recipes! Glad to get another opinion on this amazing bread, definitely a reminder that I do need to bake some soon. Have a wonderful day! Yes, I’ve been following her blog for some time so it was nice to get a deeper insight into her life and recipes. Definitely give the banana bread a go! The crystallized ginger is an interesting addition. Your banana bread looks scrumpy! Thanks Angie! And it really is a great read. OOhh! Banana bread!! I swear I can smell it now!! It’s definitely a book that I’ll be reading again and again. I’m looking forward to making more of the recipes as well! Ooh I have not read the Outlander Series, but I’ll have to check it out! Thanks for the recommendation Theresa! Oh wow! Yes, I’m of the opinion that you can never have too much banana bread 🙂 The slightly browned, crispy outside is my favorite part too! It is a great cookbook meets memoir 🙂 And thanks Kiri!! I haven’t met a banana bread I don’t like! Eating dinner together at home is no doubt better than any restaurant. We have been brought in a family like yours. the banana bread with chocolate chips and crystallized ginger is truly unique. It’s so true Neetu! And the crystallized ginger is indeed interesting. It is interesting, and very well written! There really is nothing better than eating together as a family. I’m always on the hunt for good recipes, especially variations on some tried-an-true ones. This sounds great! As for books I’m reading, I have a couple of gardening books NEXT to my night stand (the pile is too large for it), and I’m also looking at seed starting and cheese making… That’d be about enough, right?! Me too! Haha, your nightstand sounds like mine 😉 Seed starting and cheese making sound interesting! It’s definitely one of those great classic recipes to have in your repertoire. Hope you enjoy this variation! Sounds like a good book to read. The banana bread with crystallized ginger looks awesome. I love ginger but I wonder what my boys will think as they are not particularly found of it. It’s a great book to read Biren! My husband wasn’t too nuts about the crystallized ginger, although I loved it. It would be a great normal banana bread recipe without it. If I were only going to make ONE recipe from that book, it would be the banana bread with dark chocolate and crystallized ginger. Sounds amazing!! Haha I totally agree (clearly!). I hope to make many more, but I was instantly drawn to this one. What a wonderful sounding book. I’ll have to get a copy of it. When we sit up at the table for dinner my husband always says, ‘Why eat out’. It’s always nice for the cook to be appreciated. Perfect!! I’m the same way – I always shop from a list otherwise I end up with all kinds of splurge purchases. I really, really enjoyed this book, too! I went savory and just made the cide-glazed salmon (also good), but next time, I’ll go back and do the banana bread. 🙂 Lovely photos, as well. Perfect banana bread..Love how it turned out! I love your post too! Well done as always sweetie and have a beautiful weekend! I agree with what both you & Molly had to say about family dinners. I’m so glad dinnertime together was a part of my life growing up! I definitely think I appreciate sharing food with family & friends because of that tradition. Glad to see you made the banana bread! It looks magnificent. What a terrific review! I’ve read A Homemade Life twice and made many of the recipes – such a heartwarming, delicious book to enjoy. 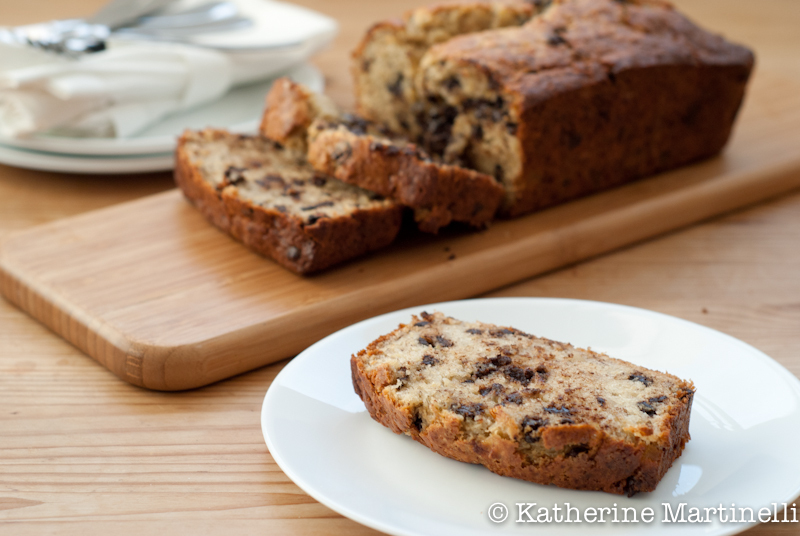 These are gorgeous photos of your banana bread! Thanks Hannah! I definitely think this is a book I’ll be reading again and again as well. And LOVING The look of your banana bread! It was such a great pick – thanks! !